Most people who follow the technology industry have a general sense there are important differences between younger and older people when it comes to what technology products they buy and how they’re used. Heck, those of us who are parents see it every day in the activities of our children in comparison to what we typically do. But despite that general sense, I’ve seen precious little data that actually quantifies what the differences are. I believe to truly understand the dynamics of today’s market, it’s essential to get a deeper understanding of these issues. That was one of the key motivations for a survey my firm, TECHnalysis Research, recently began. Ultimately, the study will consist of around 2,500 respondents across four countries (roughly 1,000 in the US, 500 in the UK, 500 in Brazil and 500 in China) answering questions in an online survey about the consumer technology devices they own and the activities they engage in with those devices. The US portion of the study just finished over the weekend and, in analyzing the results across 1,020 respondents, I found a number of fascinating data points related to what I’m calling “The Digital Generation Gap”. First, to no one’s surprise, there was a big difference in the percentage of time different age groups spent with different devices. What was somewhat surprising however, was how linear the changes were scaled by age. Survey respondents were asked to indicate which of about 25 different types of activities they engaged in on their own devices and then how they split their time in that activity across devices. The activities ranged from watching TV programs to browsing the web, reading/updating social media, casual gaming, etc., and the devices types were PCs, tablets, smartphones and TVs. So for example, people would say how many minutes/hours in a typical weekday and weekend day they surfed the web, and of that time, how much was done with a PC, tablet, etc. The results show noticeable differences in activity participation by age, as well as device usage splits for each of those activities by age. To get a general overview, I created a weighted average of all activities by age group and device, shown in the chart below. As expected, the younger you are, the more you use your smartphone. The older you are, the more you use your PC. The degree of differences between age groups and the nearly perfect tracking with age was somewhat surprising however. Of course some of this has to do with using the devices we are most comfortable with. Younger people have grown up with smartphones and older people grew up using PCs. However, there’s also a difference in the type of activities and the amount of time spent on them between the different groups. Some of the activities older people do are arguably better suited to PCs and vice versa. 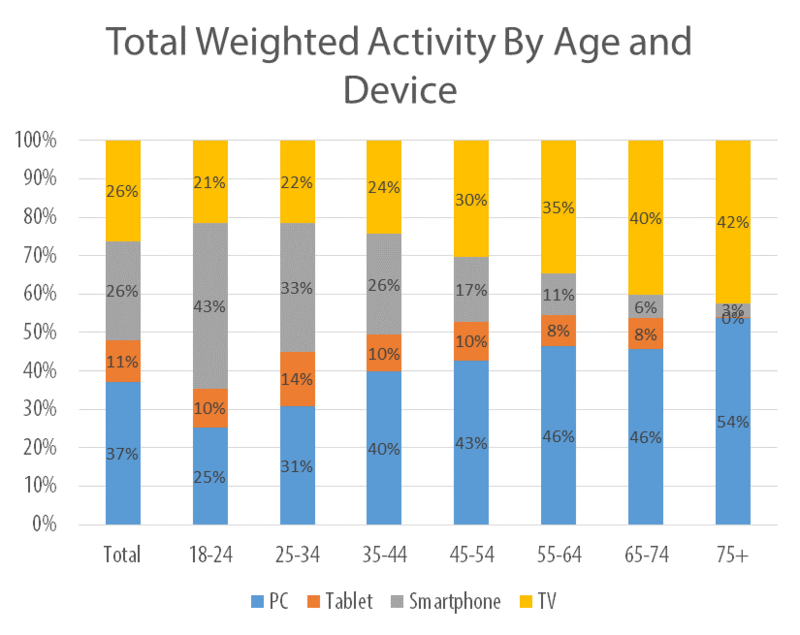 Another interesting data point from this chart is the relatively modest tablet usage and its relatively consistent percentage of use across age groups. As the numbers suggest, tablets are roughly a 10% device—something most people use about 10% of the time. While that’s OK, it’s certainly not a high enough number to get people to want to upgrade them on a regular basis. Plus, it also explains why lots of people are taking a pass on purchasing a tablet—it’s a “nice-to-have” but not a “must have” for many. I also believe these numbers could portend a difficult future for the tablet market as there isn’t a single age group that shows particularly strong usage. Plus, knowing several important large screen smartphones are on their way and given the very high usage of smartphones among younger buyers, there’s likely to be a negative impact on tablets as they get replaced by these larger smartphones. On the other hand, the strong showing for PCs clearly suggests the consumer PC category is far from dead—even among younger people—and could be due for a bit of rebound. Finally, implicit in all of these numbers is very high levels of multi-device usage per household. Regardless of the age group and regardless of the activity, people are becoming accustomed to using multiple devices to achieve or participate in popular activities and that has significant ramifications for the future. From adding more intelligence into TVs to providing scalable services that work across many screen sizes and device types, both hardware and software/services companies need to be building their offerings with that multi-device assumption as a baseline scenario.